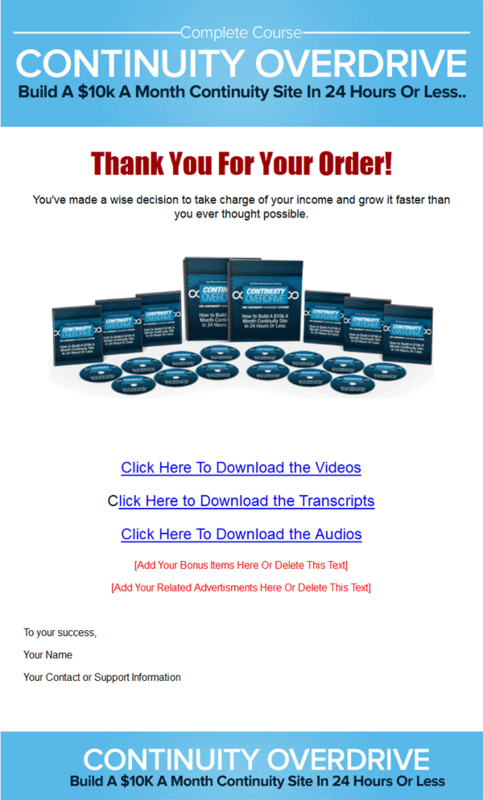 Continuity Overdrive PLR Videos is your quick Brandable product for the Membership niche. Comes with Private Label Rights so you can edit. It’s no secret that continuity programs can be one of the best ways to profit on the net. 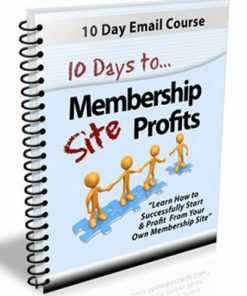 Systems like membership can be a source of recurring income that can grow into a very nice income. Best yet it can b an income that pays like clockwork, each and every month. It can be like money in the bank every month. Problem is, most people struggle to build a continuity site in the first place. 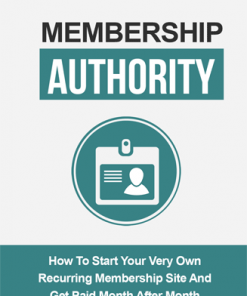 The struggle turning visitors into members and they struggle keeping those members. 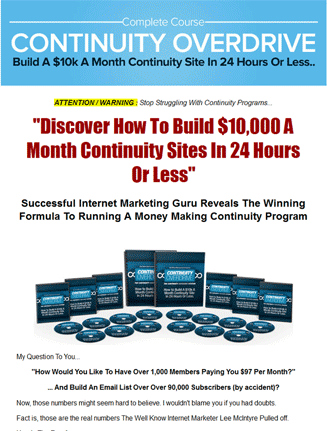 This package goes into the details of how to build continuity sites that work and pay each and every month. 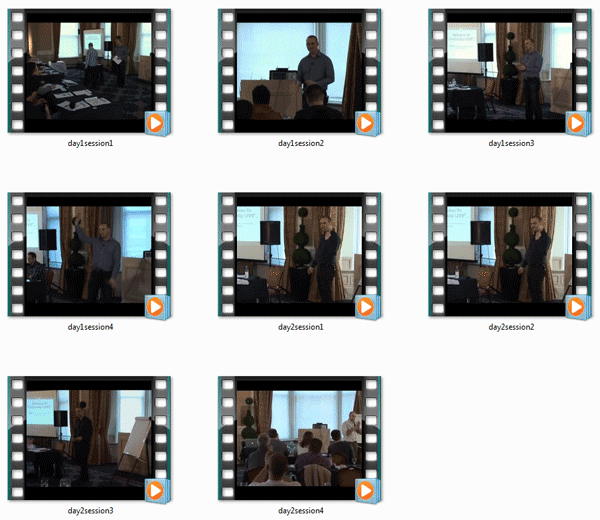 Videos – Over 9 hours of high quality video from a live workshop. These video’s show how a well know internet marketer developed a system that any one can follow to create continuity websites that can pay out big and how to create them quickly. This is not theory, it is a proven system that works and it works well. We even converted all the video’s to the perfered web video format of MP4 so they are super easy to use. Reseller Package – Comes with everything you need to resell this product. We even created a brand new sales page from scratch just for this product. We also created a brand new download page as well. Both are in standard HTML, so you’ll have no problem editing or changing them. Simply add your payment link and your download link, upload two webpages and it’s ready to make you cash on automatic. Audio Files – 8 MP3 audios, one for each of the videos. This is perfect for your customers who like to learn on the go, and there are many of them. It’s an added format that could help you sell more and increase your conversions. Since the are standard MP3 files, you’ll know your customers won’t have a problem using them. Who doesn’t have a electronic device that plays MP3’s these days? Pretty much every one. Transcripts – For your customers who want to read, they will be thankful for these documents. They are in Word DOC so you can edit, change or brand them as you want. Add your name, website address or even affiliate links. Website Template PSD – Make this one your own with the PSD for the website, so you can brand it, add your name or even your domain address. … And Build An Email List Over Over 90,000 Subscribers (by accident)? Now, those numbers might seem hard to believe. I wouldn’t blame you if you had doubts. Fact is, those are the real numbers The Well Know Internet Marketer Lee McIntyre Pulled off. As you can clearly see, that is a total of 1,331 members between the two websites that are each paying $97 every month. $129,107 Each and Every Month! Not to bad for two websites, wouldn’t you say? And as I mentioned, he also built a list of over 93,000 subscribers using this system. Thing is, most people don’t do these numbers because they don’t know the simple secrets. It can be tough to figure out how to make a continuity program work and pay off. 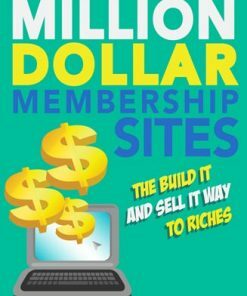 It can be tough to convert visitors into members. It can be even tougher to get those members to “stick”. 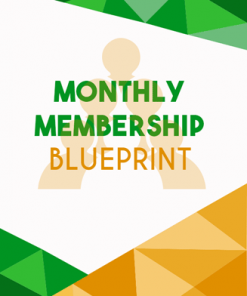 It can be tough to keep your members happily paying you as much as $97 per month. Lee has figured out the perfect system of getting and keeping members who happy pay $97 every single month. Over the course of 2 days Lee McIntyre, an internationally recognized expert on online business building and internet marketing, presented this rich content about building highly profitable continuity site to a handful of attendees. Play close attention… and observe a master at work! 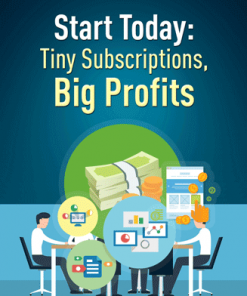 Lee McIntyre shares tip and tricks to increase the profitably of your online business. The fourth session from Lee McIntyre’s Continuity Overdrive covers critical tactics for growing your continuity program. Master important strategies for growing customers and revenue. This is the last module on Lee McIntyre’s Continuity Overdrive. Learn the best ways to improve your internet marketing skills and online business. This is your opportunity to build a business that pays you very well. And you could start TODAY. Transcripts for each module so you can read at your esquire. Take notes, book mark pages or review those important steps. MP3 audio files for each module so you can learn on the go. Listen and learn while your drive, out jogging or lounging around the house. Even if you are a compete beginner, this step by step series breaks down these effective strategies to make it easy to understand and implement. 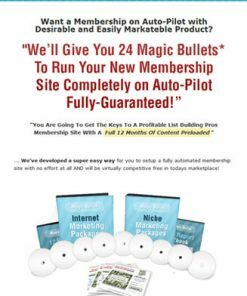 It’s a simple and proven system developed by the respected and highly successful internet marketer, Lee McIntyre. Some one who actually walks the talk. Are you serious about your online business and are you ready to start using Proven and highly profitable Continuity Program techniques? If yes then Great, Click the buy button right and lets get started. 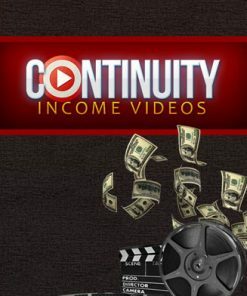 If you’re a seasoned marketer wanting to take your income to a whole new level or you’re just a beginner ready to go from being a serial buyer of products to being a successful online business owner, the Continuity Overdrive Program will give you the exact tools, tactics and strategies so you can achieve just that. Are you ready to take things to the next level? If you are then you can be diving in to it within the next 5 minutes, just click the buy button to get started. It’s the decision you make Right now that is important and a decision which will put you on the right path or the wrong path.